Starting out with the eerily compelling “Water Jet Cilice”, Bird brought a different mood to Saturday’s show, a more laid-back atmosphere as compared to Friday’s high-energy assault of sound. Creating every sound on his own with the help of his looping machines, songs stretched and formed right in front of you. It’s easy to forget just how much of what you hear is Andrew Bird and his cluster of instruments when watching the full band. As a solo act, however, you’re confronted with that fact early on, making it hard to deny the special kind of genius he exhibits in his work. The explanation of “Sweetmatter” (it being inadvisable to release a song containing a reference to mad cow disease) and the lyrics (“that’s the taste of neurons blinking”) drew laughter from the audience. While I’ve heard it before, being with an audience where many seem to be hearing the song for the first time gave it a whole new freshness. Proceeding to launch into the moody instrumental opening of “Why?”, Bird continued to amaze with his perfect delivery of the lyrics, where deadpan humor, anger, and raw emotion all coexist in one song. Though he mixed up some of the lyrics at the end, this is one song where you half expect that to happen, given how the song consumes him. “I just get so angry,” he said with a smile, explaining away the bungled lyrics. He followed that with the first new song of the night, which he’s currently calling “Wake Up”. The music is adapted from the instrumental “You Woke Me Up!” from Useless Creatures, and incorporates original lyrics as well as parts of the traditional song “Keep Your Lamp Trimmed and Burning”. This being the second time I’ve heard this one (he also played it at the show at the Art Institute of Chicago last month), I caught a few more snippets of lyrics; standing out most was the line “when you break up, there’s no one by your side; darling, you’re all alone”. 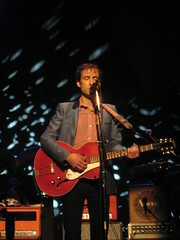 After “Effigy” (performed completely on guitar), the lights dimmed to illuminate Bird with a single spotlight, white lights sparkling on the dark screen behind him. He introduced a brand new song, one which he’d never performed for anyone other than the person who wrote the lyrics. (The lyrics were largely written by a friend of his for a play; I believe he said the name of it was “The Sifters.”) He seemed almost uncharacteristically nervous, pausing for a few moments to collect himself before starting the song. You could have heard a pin drop as he played, and I felt like the whole audience collectively exhaled when it was finished. He continued on with “Anonanimal” (where he once again forgot about the switch mid-song from violin to guitar; “I forgot that I’m supposed to be ready for that,” he said afterwards), “Natural Disaster”, and “Keep Your Lamp Trimmed and Burning,” which he mentioned would sound familiar, as it formed part of the basis for “Wake Up”. The song got off to a great start, until he stopped abruptly right before the lyrics should come in. “Now I keep confusing myself,” he announced, staring off into space as he tried to remember the words. After a helpful audience member shouted out the opening line, the song continued on, just as though someone had simply pressed pause for a moment. Bird brought out Annie Clark of St. Vincent for the next two songs, providing some of the most beautiful moments of the evening. She joined him first on “Lusitania”. He gave a bit more of an explanation of the song’s origins this time; the line about the Lusitania was in “Natural Disaster” at one point, but got taken out when it didn’t work with anything else. Bird said that it had taken him three or four years to figure out how to use naval history as a metaphor for relationships and the excuses we make for conflict. 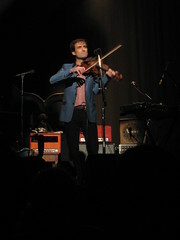 Now that description right there is quintessential Andrew Bird. Clark sang the latter verses of the song, which Bird said were about electricity, “two completely different things hanging out in the same song”. They followed that up with one of Annie’s songs, “Marry Me”, from her first album. The two performed an acoustic version of the song for a French music site earlier this year, and I know that many were hoping that they would reprise that performance for this show. 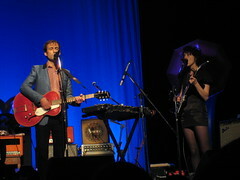 Their voices and musical stylings work perfectly together, two eclectic indie darlings unafraid of playing with sound. Bird brought out the rest of St. Vincent to close out the show with “Scythian Empires” and “Tables and Chairs”. Watching him perform with this different backing band, I felt like I was watching Andrew Bird the frontman. I’m not really sure what was different, other than the fact that there were more people on stage and more varied instrumentation (including a second violin), but during those closing songs, Bird was perhaps the most unlikely rock star ever to take center stage. As an encore, Bird and Clark took to the stage again, huddled around a single microphone to perform a stunning acoustic version of Bob Dylan’s “Oh, Sister”, a song which Bird put out on an EP a few years ago and which rarely makes its way into his show. It was an incredibly special moment, just two beautiful voices together, the song performed without loops or machinery. For his final song, he played “Weather Systems”, a perfect bookend to concert. The show ended much the same as it started: a lone man on stage, violin in hand, and a haunting whistle piercing the air. I wouldn’t have it any other way. Check out my set of photos on Flickr of the second night. In more personal notes, consider this a shout-out to all the amazing people who I met at the shows. Audiences for Andrew Bird shows are consistently among the most respectful I’ve ever encountered, and while I’m not exactly a people person, I was more than glad to strike up conversations with fellow fans. Also, major props to the group of die-hards who waited after the show in hopes of getting to meet Bird (end result: mission accomplished). It takes a special artist to compel people to wait for around two and a half hours in the cold, and an even more special artist to take the time to talk to each person there, and give out signatures, handshakes, and hugs, even if it was 1:30 in the morning and sleep was probably the most important thing on the agenda. Additionally, Radio Milwaukee broadcast Friday night’s show on the radio and as a podcast, which is available for download here. This is where I sit in awe of just how giving Andrew Bird, his management, and his label are to fans, because here they are, permitting a free broadcast and download of a show which is eventually going to be released on DVD. I can’t even begin to count the number of artists who would never approve of that happening, even among artists who have fairly liberal taping policies. This is a fantastic review, thanks for writing it! I’m so looking forward to listening to this concert, especially now I’ve seen your writeup of what it was like.